Volkswagen Golf GTI Performance, Engine, Ride, Handling | What Car? 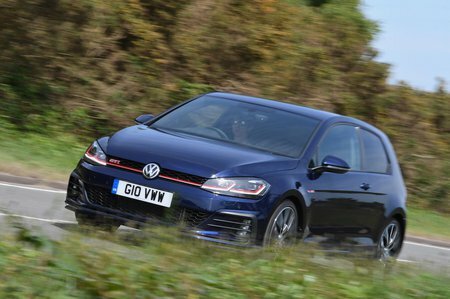 As we've already mentioned, the range begins with the Golf GTI Performance edition, which has a turbocharged 242bhp 2.0-litre petrol engine (VW calls it the 2.0 TSI 245). That's less firepower than many rivals, including the Honda Civic Type R and Hyundai i30N, have under their bonnets. However, what's important is that the GTI Performance feels suitably spritely, even from low revs, and is jolly flexible in everyday use. To get close to the straight-line pace of the Type R you'll need to look at the range-topping GTI TCR (badged 2.0 TSI 300). This gets revised engine software and a different exhaust system to boost power to 286bhp. Okay, that's still not quite Type R-matching power, but it's not far off and you can really notice the extra surge over the Performance model at higher revs. It's just a shame neither version makes a very exciting noise, despite the efforts of their digitally enhanced engine notes. The Performance come with a six-speed manual gearbox, which is slick but not as delightfully precise as the Type R's manual 'box. Where the GTI has the advantage over the Type R, and other hot hatches like the i30N, is that you can also order it with a seven-speed dual-clutch auto (standard on the TCR). It's not as interactive and enjoyable as the manual, but if you do lots of miles and want something quick but fuss-free, then the auto has its advantages. It's also very responsive and shifts gears far quicker than a mere human can. When the road starts to get twisty you can rely on the GTI’s balance and poise, with tight body control to get you round corners without drama. Its steering is beautifully accurate and weights up predictably so you always know what the front tyres are up to, which gives you plenty of confidence. With tweaked steering and – if you add the DCC adaptive dampers – suspension, the TCR version is even more of a pleasure to drive hard. Indeed, the GTI is even more composed than the i30N, but if absolute driving pleasure is your number one priority, we'd suggest the Type R still rules the roost, with the Megane RS not far behind — the Type R, because it is so beautifully balanced and grippy, and the Megane for its playful handling. 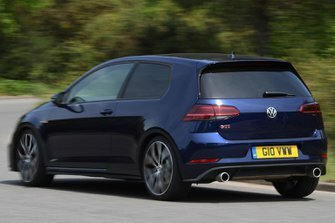 The other reasons we rate those rivals above the GTI is their traction out of bends; the GTI may have a limited-slip differential (LSD), but it's not as aggressive as those you'll find in the two aforementioned rivals, so the GTI can't claw its way out of slow corners quite as tenaciously. We’d definitely suggest adding the DCC suspension system we mentioned earlier – even though it is a bit pricey. Why? Because it helps make the most of the Golf’s chassis: in Sport mode it stiffens things up to keep body control even tighter through bends, without making the ride overly harsh. And, if you fancy relaxing for a while, you can slacken the dampers off by choosing Comfort mode, giving you a ride that's remarkably supple by hot hatchback standards. If the Golf’s adaptive set-up is a bit beyond your budget, don’t worry: while the standard suspension might not offer quite the same smooth ride of a Type R, it’s by no means uncomfortable. 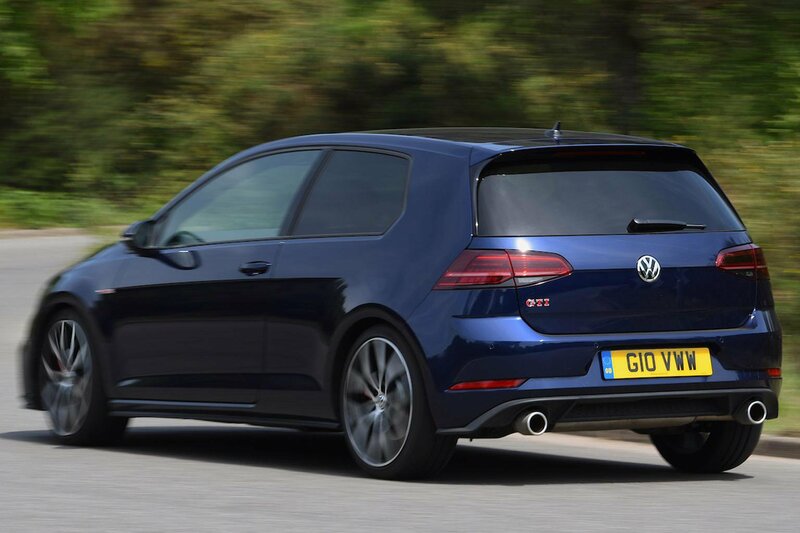 The great thing about the Golf GTI is that, when you aren’t in the mood to hack across country, it’s still a Golf. That means it plays the refined cruiser very well, with very little suspension noise and just a light flutter of wind noise from the door mirrors at speed. You do have to put up with a little more road noise from the GTI’s larger tyres, but even this isn’t irksome.